An intraocular lens (IOL) is the artificial lens surgeons implant to replace the eye’s crystalline lens that must be removed once it becomes cloudy. The main job of the IOL is to focus light onto the back of the eye (or retina), (retina: the transmitter located at the back of your eye that sends the images to your brain) just as a natural, healthy eye lens would. From here, the light rays are converted into electrical impulses that travel to the brain, where they are then converted into images. If the light isn’t focused correctly on the retina, then the brain can’t process the images accurately. 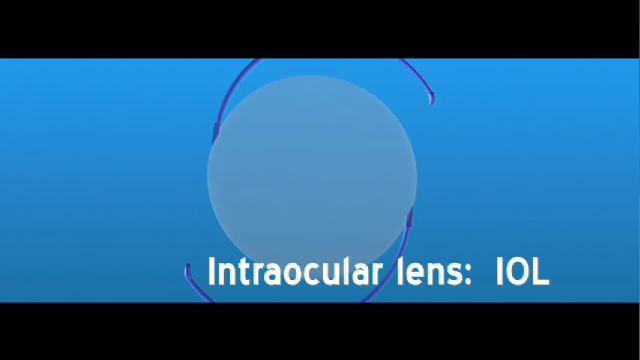 IOLs share the same basic construction as earlier versions—a round, corrective central portion of the lens with 2 arms, or haptics, to keep it in place in the eye—but other than these shared characteristics, modern IOLs can vary widely in ‘ design, being made of plastic, silicone, or acrylic. Most of today’s IOLs are about a quarter of an inch or less in diameter and soft enough to be folded so they can be placed into the eye through a very small incision. The most common type of IOL is called a posterior chamber lens, meaning it is placed behind the iris within the capsule where the natural lens used to be. When it is placed in front of the iris, as might happen when the lens capsule is damaged, it is called an anterior chamber lens. 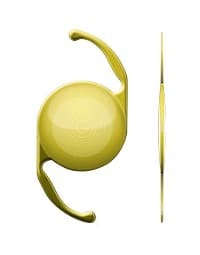 Monofocal IOLs, such as the AcrySof® IQ IOL, provide a set focal point, usually for distance vision. This allows cataract surgery patients to see clearly within a range. About 95 percent of people who receive a standard IOL have their vision restored to its pre-cataract state.1 However, most patients still require glasses for reading or distance vision. Monovision is a technique the surgeon may choose to perform that involves inserting an IOL in one eye for near vision and an IOL in the other eye for distance vision. This technique requires adaptation, since each eye will then be oriented towards different needs. While there are several advanced technology IOLs on the market today, the newer and most popular ones are made by Alcon®, such as the AcrySof® IQ ReSTOR® IOL. In addition to treating the cataract, some IOLs can also correct astigmatism at the time of surgery. These lenses will minimize the need for distance vision glasses after surgery. One such IOL that has gained widespread popularity is the Alcon® AcrySof® IQ Toric IOL (made specifically to address cataracts with astigmatism). No single lens works best for everyone. Only your eye doctor can determine the most appropriate option for you and will work with you to help select the right course of treatment. When you need a hospital for your eye care, we hope you will choose one in your community such as Otsego Memorial Hospital, Mercy Hospital Grayling and McLaren Northern Michigan – Cheboygan Campus. These hospitals are here for your convenience and they support your community and ultimately you – please make them your first choice. When you keep your business local: businesses benefit, jobs benefit, schools benefit and the entire community benefits. We support our community and we hope you will too.